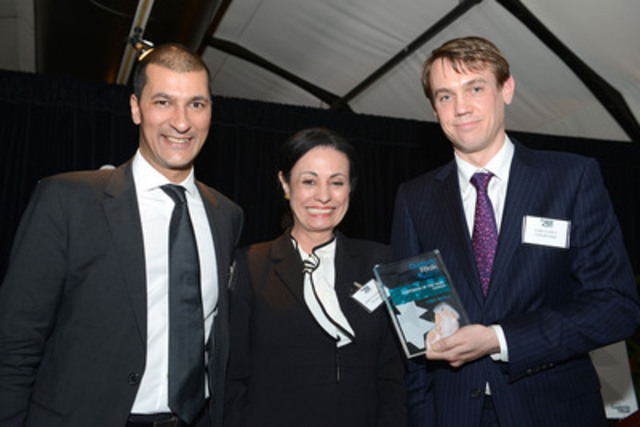 TORONTO AND NEW YORK, May 14, 2013 /CNW/ - CIBC Mellon has earned the title of "Custodian of the Year: Canada" in the 2013 Custody Risk Americas Awards. Custody Risk Magazine's Americas Awards recognize outstanding achievers in the securities services industry in both North and South America. The awards were announced and presented at a ceremony in New York on April 18, 2013. "Our panel of judges reviewed detailed submissions from various custodians operating in Canada to evaluate their products, services and technology offerings, as well as feedback from clients. Based on a very strong asset servicing solution and high marks from its clients, the panel identified CIBC Mellon as Canada's top custodian for 2013," said Luke Clancy, editor, Custody Risk magazine. "We are extremely proud to be recognized as Canada's top custody provider with this prestigious award. Being named "Custodian of the Year" for Canada by Custody Risk reinforces that our relentless commitments to client service, market-leading technology and continuous improvement are delivering Canada's very best asset servicing experience," said David Linds, senior vice president, business development and relationship management, CIBC Mellon. Custody Risk's independent judging panel assessed nominees for the Custodian of the Year award based on a number of factors, including: client testimonials; major mandates won or retained; overall business growth; product innovation; response to market changes; and counterparty stability and risk management capabilities. With new regulations on central clearing, margining and collateral segregation coming into effect, the role of the custodian is arguably more important than ever. Custody Risk includes news, analysis and research on the latest industry developments. Custody Risk has recognized industry players in its Americas Awards since 2011. Custody Risk is part of the Risk.net brand of financial risk management news and analysis properties operated by Incisive Media. All of the Risk.net brands including Asia Risk, Credit, Energy Risk, Life & Pensions Risk, Operational Risk & Regulation, Risk and Structured Products post articles on the fast-moving worlds of complex and sophisticated finance, regulation, derivatives, and risk management. Visit www.risk.net to learn more. CIBC Mellon provides asset servicing solutions, including custody, multicurrency accounting, fund administration, unitholder recordkeeping, pension services and securities lending services, for institutions and corporations. We have over 1,000 people dedicated to supporting more than 1,200 client relationships with Canadian banks, pension funds, investment funds, corporations, governments, insurance companies, foreign insurance trusts, foundations and global financial institutions whose clients invest in Canada. As at March 31, 2013, CIBC Mellon held more than CAD$1.2 trillion of assets under administration on behalf of our clients. CIBC Mellon is headquartered in Toronto, with offices across Canada in Vancouver, Calgary, London, Montreal and Halifax. Founded in 1996, CIBC Mellon is 50-50 jointly owned by Canadian Imperial Bank of Commerce (CIBC) and The Bank of New York Mellon Corporation (BNY Mellon), the world's largest custodian. CIBC Mellon is part of the BNY Mellon network, which as at March 31, 2013 had USD$26.3 trillion in assets under custody and administration and USD$1.4 trillion in assets under management. CIBC Mellon is the corporate brand of CIBC Mellon Trust Company and CIBC Mellon Global Securities Services Company and may be used as a generic term to reference either company or both companies collectively. For more information - including CIBC Mellon's latest knowledge leadership on issues relevant to institutional investors active in Canada - visit www.cibcmellon.com or follow us on Twitter @CIBCMellon.